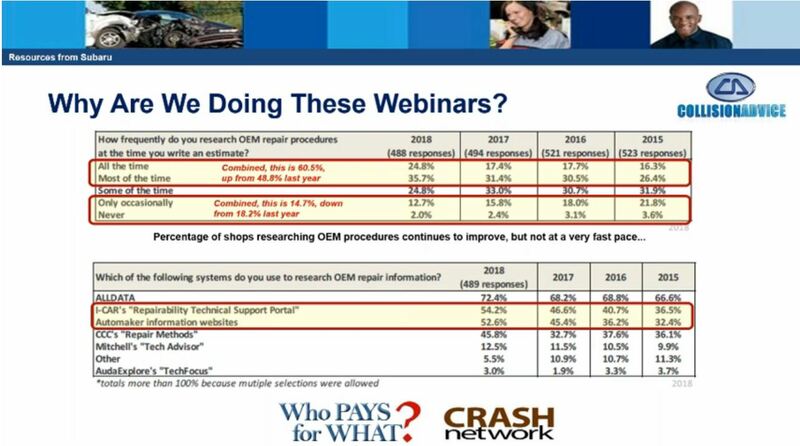 “Who Pays for What?” data last year revealed 60.5 percent of 488 surveyed shops reported researching OEM repair procedures at the time of the estimate either all or “Most of the time,” a big leap from the 48.8 percent of the 494 respondents in 2017. However, only 24.8 percentage points of that 60.5 percent shops were researching procedures every time. The majority, 35.7 percentage points, still fell short of what experts advise should be done with their “most of the time” answer. “This is a concern for us,” Mike Anderson, CEO of study co-author Collision Advice, said while presenting the data during a webinar on Subaru OEM repair procedures in December 2018. Experts recommend looking up repair procedures online anew on each estimate, even a vehicle make-model-year combination a shop has fixed before. Housing repair procedures online means OEMs can and do change them — Anderson likes to cite one manufacturer who changed bedside procedures four times in a year — and a shop might not receive any notice. The 2017 “most” and “all” results were a middling gain (well within the margin of error) over 2016. However, it’s important to note they were collected throughout the month of July 2017 — many likely before attorney Todd Tracy announced the Seebachans’ lawsuit July 24, 2017. I-CAR’s Repairability Technical Support portal, which contains links to official OEM repair procedure websites and answers the education organization has received from OEMs over the years, was second at 54.2 percent of respondents (shops using more than one resource were allowed to provide multiple answers), up from 46.6 in 2017. The actual official OEM repair procedure websites were used by 52.6 percent of shops, up from 45.4 percent. Finally, CCC Repair Methods grew from 32.7 percent of respondents in 2017 to 45.8 percent in 2018. Despite the gains recorded in both repair procedure software usage and overall reference, the problem of shops failing to consult repair procedures before fixing customers’ vehicles might still be severe. 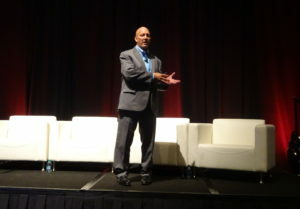 Collision Industry Conference Chairman Jeff Peevy (Automotive Management Institute) recently reported conclusions that the auto body sector is divided into engaged, active shops and other too consumed with their small-business problems to engage with the broader industry. We’d suspect the “Who Pays?” respondents skew towards the former group, and the industrywide picture might not be as rosy as their responses suggest. “Recommend”: The webinar took a question on if OEMs would use stronger language, such as “require” instead of “suggested” or “recommended,” in position statements. Anderson said that based upon his experience, it can have to do with the culture of some Asian manufacturers. To say something was required would be considered “demeaning” and “rude”; you would defer to the “politest” way of saying something, according to Anderson. For example, in Japan, a recommendation by one’s boss or father would be a command, he said. However, Anderson also noted that “myths” exist on how often OEMs say “recommend” in position statements. He said that while some OEMs merely recommend pre-repair scans, none that he’d seen used the term for post-repair scans. Rather, terms like “must” or “mandatory” were used then. Position statements: Subaru is an anomaly among OEMs in that its position statements aren’t stored on its official repair procedure website. According to Anderson, those documents can only be found on the auto industries’ OEM1Stop or CrashRepairInfo portals.